I went to Whakatane to teach for the weekend . I left Wellington at about 7.30pm on one of those flying pencil cases. Then the pilot said that the de-icers had broken down on the propeller and the crashing sounds on the side of the plane were bits of ice falling off the prop and hitting the plane as they flicked off. They landed us in Palmerston North and couldn't fix it so stuck us on a bus to Whakatane. It took them ages to find a driver who hadn't gone to the pub so we finally got to Whakatane at 4.30am. I am not sure that the person who billeted me was expecting to have to get up in the middle of the night to let me in (I did tell her just to leave the door unlocked and a note on the bedroom door). 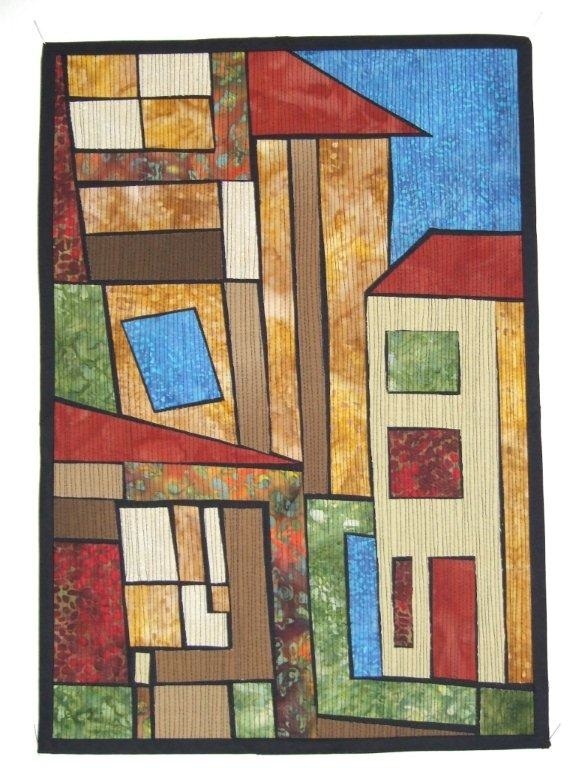 All the quilts made in this class - called 'The Next Step' are different. 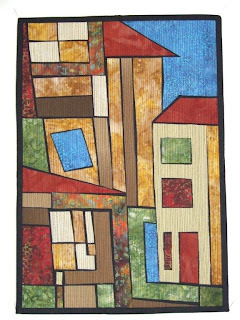 This is one of the quilts made in the class, thanks to Pauline for letting me put it on my blog. She has called it 'Living Outside the Square' and she has quilted and bound it since the class finished on sunday - that is less than 2 days ago! Well done Pauline. Now back in Wellington and we are gearing up for the workshops with Yoshiko Wada, the author of the book 'Shibori: the art of shaped resist'. She is doing 3 public lectures in New Zealand. 2pm on 23rd September, nelson School of Music, $20 per ticket.